Making fresh pasta daily at Padella, Borough Market. Landing in London, our first thought – after a pint at a classic pub, of course – is to hit the hottest bars and restaurants in town. But with an ever-changing dining scene, how to keep up? With our up-to-date hit list. Duck and Waffle serves up just what you’d expect. Navigating London’s dining scene can be as treacherous as a swim in the Thames. A veritable minefield of options lay before you, some breathtaking, some mediocre and some outrageously expensive. 2017 has seen successful pop-ups making the move across the city to permanent homes (with flavours of the subcontinent proving to be the hottest menu items), while hotel restaurants have gone from drab to fab with some of the best restaurant openings in town. Here’s our guide to uncovering the best newbies, with some classics thrown in for good measure. Taking in the affluent inner city areas of Mayfair, Marylebone, Fitzrovia, Covent Garden and Soho, the West End is much more than just bright lights and tourist fare. Hotel Henrietta conceals an excellent bar from the street. Boutique Henrietta Hotel is a gorgeous design lover’s paradise with touches of marble, oak, and greenery throughout. This continues through the light-strewn restaurant with a seasonally led menu by Michelin-starred chef Ollie Dabbous – expect delicate plates featuring the impressive techniques Dabbous is renowned for. Drinks have been carefully curated and nod to the location’s rich past. Charred octopus mashawsha (a type of hummus), eggplant sharabik and smoky baba ganoush; for truly amazing modern Mediterranean food that hints at the Middle East including Israel and Lebanon and back towards Tunisia, Egypt and Morocco, The Barbary delivers. It’s also the hottest ticket in town and one that is now (thankfully!) taking bookings – mind you they’re for 12pm and 5pm sittings only. The perfect spot to imbibe after a hard day’s shopping along Oxford Street is The Wigmore at The Langham. Set in a former banking hall, the menu is overseen by Michel Roux Jnr, the two Michelin-starred chef behind Le Gavroche in Mayfair (a timeless winner for its luxe French menu) and features a ridiculous XXL stovetop toastie, a beast of a cheese toastie that oozes aged cheddar and onion and comes under its own cast-iron press. An assortment of dishes at Xu (photo: Carol Sachs). 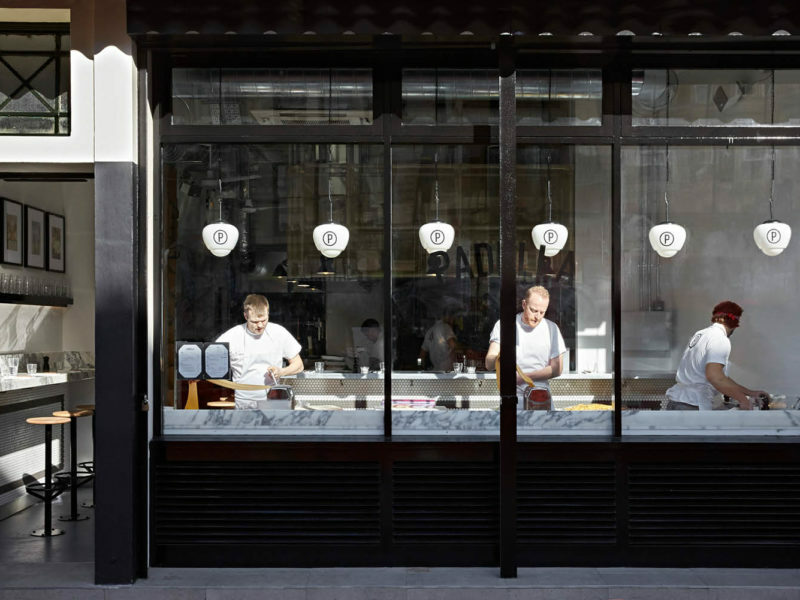 The brains behind the pillowy Taiwanese buns at BAO (Fitzrovia, Soho and Netil Market) have now opened XU in Chinatown. Pronounced ‘Shu’, this is grown-up Taiwanese – think unctuous char sui Iberico pork and cuttlefish and prawn toast with whipped cod roe – and all served in a gorgeous wood-panelled dining room with Art Deco touches and hand-painted murals perfectly exuding the 1930s vibe of Taipei’s social clubs. Kricket Soho has a vague milkbar vibe. What started as a tiny 20-seater in Brixton’s trendy Pop Brixton, Kricket now dishes up Mumbai flavours in its new Soho home. Crispy pakoras, Keralan fried chicken with curry leaf mayo, pumpkin makhani curry with puffed rice – whatever you order, everything is made to share and is ridiculously moreish. Hoppers was a hit in Soho for its bold Sri Lankan flavours but deterred many with its no-bookings policy and huge queue. Newly opened Hoppers in St Christopher’s Place is taking bookings for its reinterpreted menu, and has a cocktail menu based on the flora of Sri Lanka’s spice gardens. Expect the same favourites such as the bone marrow varuval and a more expansive curry menu. Other spots to check out include Kiln, Temper and Social Eating House. And what if you’ve found yourself in Mayfair and are in need of some Champagne? Bob Bob Ricard has table-side Champagne ordering buttons, or you can head to French restaurant and pink palace, Sketch, where drinks flow until 2am. Sea Containers London – Dandelyan Bar. South of the river entices with the Bermondsey Beer Mile, where craft beer makers are brewing interesting drops, and with Borough Market; a showcase of some of the city’s best fresh fruit and veg, butchers, dairy, bakers and food stalls. Just a way down from the Tate Modern, Sea Containers London – Dandelyan Bar is shaking some very highly regarded cocktails in a luxurious Tom Dixon-designed space with incredible river views looking towards St Paul’s Cathedral. Recline on pink velvet banquettes as you sip on a concoction from award-winning bartender Ryan Chetiyawardana. A Vitrian rose spritz from Sea Containers London – Dandelyan Bar. Rick Stein’s at Barnes brings classic seafood to the table. A little further west, Rick Stein, Barnes is the new seafood-led restaurant from the king of the seas and his first foray into the London dining scene. Head here for the freshest British seafood and a peaceful Thames-side outlook. Beef shin ragu at Padella (photo: Elena Heatherwick). Other south London spots to check out include: Padella at Borough Market; The Dairy in Clapham and anything at The Shard – you cannot beat that view. London’s East End continues to be the punk little sister to the ritz and glam of the West End. Spend time exploring the multicultural streets of Bethnal Green or soak in the vibrancy of Hackney – this is the place where almost anything goes. It’s a simple premise; à la carte by day and a daily changing five-course tasting menu by night. Lyle’s serves up carefully layered plates of protein and veg that’s deserving of its recent one Michelin star. Podded peas have never tasted so fresh. 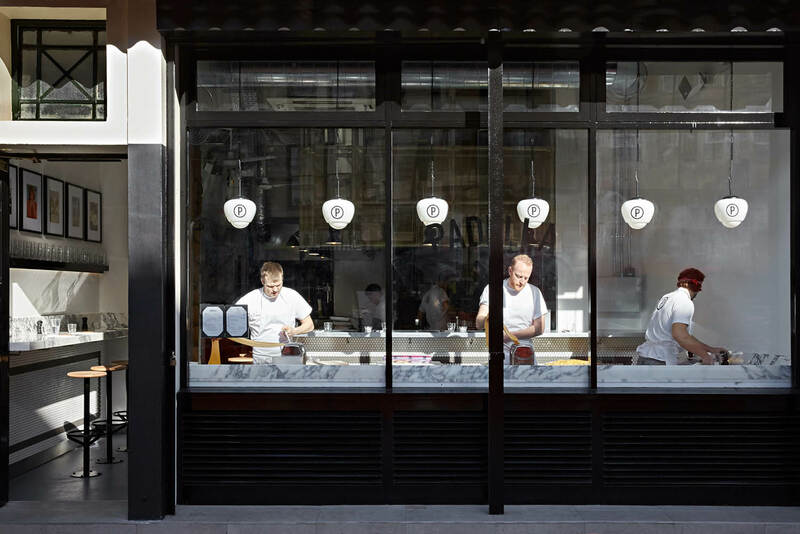 Bookings are essential for the weekly changing four-course menu at Pidgin, a cosy (read: tiny) restaurant that charms with its modern British flavours that span anything from highland beef with parsnip and peanut to charred baby gem lettuce and partridge with sweet corn and white beetroot. Modern Indian with plenty of herbs and citrus, Dishoom has become London’s go-to Indian (and the lines out the front attest to that). Whether you’re at the Shoreditch branch or one of the other four locations (King’s Cross, Covent Garden, Carnaby or Kensington – set to open soon) expect excellent cocktails and fabulous vibrant food. Other East End spots to check out include: brand-new Red Rooster at The Curtain, Fergus Henderson’s St. John Clerkenwell and Smokestak.